a Geology Trip to the Oceanview Mine in Pala, California. Collect your own gems at the world-famous Pala Mining District! 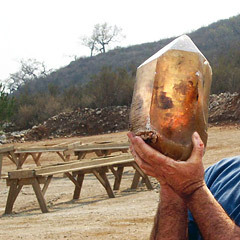 A hefty crystal removed from the Oceanview mine. Screening tables are shown in the background. Riding chartered mini-coaches, we will leave the Westin Hotel (Pasadena) at 8:00 a.m. to travel to the Oceanview Mine in the Pala mining district of northern San Diego County. This is the last operating mine from a region that once had 73 mines, producing beautiful tourmalines (some with “watermelon” colors of green and pink), lavender lepidolite mica, plus beautiful crystals of quartz, morganite, beryl, kunzite, garnet, spodumene, and many other rare gems. 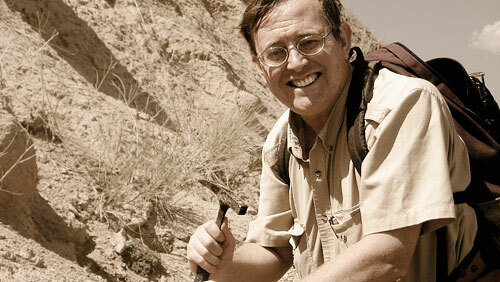 The trip includes a lecture by Dr. Donald Prothero on the area geology and how crystals are formed and a tour the mine in small groups. The mine will provide work stations consisting of a table, screen, and bucket. Screen as many buckets of fresh material from the mine as you like and keep any gems you find. This activity takes place in the parking lot outdoors so be sure to dress for the weather. Boxed lunches and drinks will be provided. $20 of your fee is a tax-deductible donation to the Skeptics Society. “Ziplock” bags, a backpack or bucket to bring home your rocks and a prospecting spirit! We will be at the mine site from approximately 10:30 am until 3:00 pm and will return to Pasadena at approximately 5:30 pm. Space is VERY limited as there are only 48 screens. You may wish to share your screen with someone, or for an additional fee, have your own. The total price for the tour if you share a screen is $145 per person. The total price for the tour for a single screen is $170 per person. Children are welcome at $135 per child for a shared screen. Cancellation after November 15 will not be refunded. Or call our office with your information at 626-794-3119. In addition to the registration form, two liability forms will be required. and Skeptics Society liability form will finalize your registration. 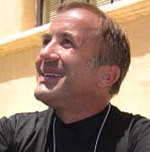 On Thursday evening, November 15, Dr. Michael Shermer will be speaking on “The God Question”. The evening begins at 7pm. Additional information and tickets for the event, which includes other speakers, entertainment, and food, can be found at: www.thegreatamericangodout.com/9.html. Dr. Shermer will expand upon his research on why people believe in God and why we are moral, originally presented in his books How We Believe and The Science of Good and Evil, to discuss the resurgence of both theism and atheism in America since 9/11. On October 16th, 2007, Skepticality released an episode featuring my audio op-ed essay on the future of skepticism (which you can download here as a 47 MB MP3 file, or as a text-only PDF). It brought an immediate response from listeners. I hoped this might get people chatting a little bit, but it seems to have really struck a nerve. There definitely is a discernible current of opinion among these many comments, which is an illuminating bit of informal market research. For example, respondents generally agree that skepticism should be apolitical. They also agree that atheism is a separate issue, from which organized skepticism should keep its distance. I’m particularly encouraged by the groundswell of support for my central thesis: that skepticism should renew its focus on its traditional core concerns regarding the investigation and criticism of paranormal claims. Finally, another common theme quite caught me off guard. Many people wrote to say they felt moved to help, to contribute, to become skeptical activists! I’m tremendously grateful to these people for their inspiring enthusiasm. Many of them asked the natural next questions: What do we do from here? How do we do effective skeptical activism? How can individual skeptics help, exactly? Those are big questions, which we’ll be addressing soon on an upcoming episode of Skepticality. In the meantime, we’re pleased to share a selection from the responses in the writers’ own words.